A flat iron can be your hair's best friend or its worst enemy. It smooths and straightens the hair, but too much heat can damage and dry it out, leaving it frizzy and full of static. Moisture is the key to getting and keeping your hair healthy and preventing any more harm. Many companies have started selling products especially designed for use with heating appliances, making hair more manageable and picture perfect. Here are our best six suggestions on how to avoid that pesky static. Go to your local salon or beauty supply store and purchase a moisturizing shampoo and conditioner for dry and damaged hair. The ingredients and vitamins in these products will help to reduce dryness, which is the main cause for static in the hair. Look for products that also protect from heat appliances to coat and soothe the hair while using blow dryers, curling irons and flat irons. Avoid washing your hair too much — washing every other day to every two to three days is ideal to prevent stripping any natural oils or moisture out of the hair. Use a deep conditioner or hot oil treatment at least once a week. Spray a leave-in product on towel-dried hair to give it an extra boost of vitamins and moisture. Put the blow dryer down for awhile, allow the hair to air-dry completely before flat ironing. The less the heat, the better. Use a flat iron with ionic ceramic plates that prevent and avoid static and burning by spreading out the heat on the plates instead of concentrating on one portion. Use hair styling products, such as straightening serum, gel and frizz cream, before using any heat. These products seal in moisture and coat the hair to prevent heat damage and breakage. Use sparingly, a little goes a long way with these hair products. Spray a small amount of hairspray all over the hair after flat ironing and smooth with your fingers. Run a clothes dryer sheet gently down the hair and anywhere there is static. These sheets are mainly used to work for static on clothing but can also help to rid static in your hair. Use a hard rubber or metal combs and brushes with natural fibers. 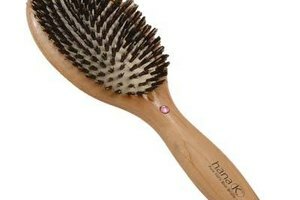 These items reduce static and breakage leaving the hair less damaged and easier to style. 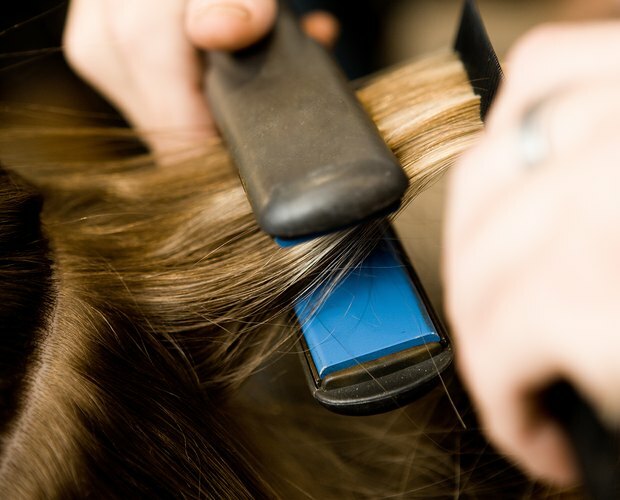 Turn down the heat on the flat iron, many irons go up to 450 degrees F and cause severe burning and damage. Using a lower heat setting will still straighten the hair while putting less heat on delicate hair.